Team Manager Larry Pegram explains the decision to pull out from the series. Team Hero EBR will be forced to withdrawal from the World Superbike Championship for the immediate future. With the recent bankruptcy of EBR and the reprioritizing of efforts by title sponsor Hero, Pegram Racing is unable to continue its Team Hero EBR program at this time. Pegram Racing is dedicated to returning to racing very quickly and will announce our future plans very soon. In making the withdrawal announcement, Pegram Racing would also like to recognise the dedicated employees of EBR, who lost their employment with the bankruptcy. "We have worked closely with them and not only appreciate how amazing it was to have a true American Superbike to ride, but how intensely hard that small group of employees at EBR worked to build the EBR bikes, and also support our racing program and other racers." said Larry. "We are hoping they too will return soon. They deserve to continue." 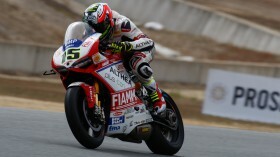 Baiocco and Canepa all-set for Jerez. The teamwork continues! Can Baiocco and Canepa triumph? 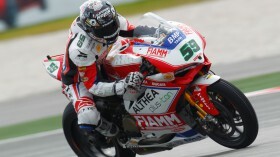 Althea Racing riders all-set to tackle bumpy Sepang.